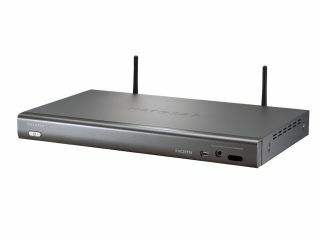 Netgear has responded to us about the confusion surrounding the streaming of protected iTunes content with its EVA8000 media streamer. At its CES press conference a spokesman clearly said that it was possible to stream protected iTunes content, while Netgear's website said this wasn't possible. "We can say that EVA8000 can output the audio from protected iTunes music files as long as iTunes is installed and authorized on the Windows PC (not a Mac) along with our Digital Entertainer for Windows PC software." "We do not have Apple FairPlay DRM on the EVA8000. You will be able to select an iTunes file and hear it on the TV or speakers connected to the EVA8000." So it's Netgear software that's streaming the content from the audio of the base PC, rather than there being some kind of mystical jiggery pokery or a FairPlay license. And you'll have to actually play it from the PC itself, rather than streaming your music on demand. Rather like wireless speakers. And to think they could have told us this at the press conference.